Working as I do in an office with others, I wonder sometimes whether I should eat as much garlic as I do. Don’t get me wrong. Nobody’s actually said, or hinted at, anything to do with garlicky aromas. Not unless their hints have been far too subtle for me to pick up. But, considering the amount of garlic I cook with and eat, some scent of last night’s dinner must surely remain the next morning? A friend told me a while back not to worry about it. Her theory was that if you eat garlic all the time, your body is accustomed to it and so then you won’t smell of it. If you don’t eat it all that often though, on the occasions when you do, the scent tends to linger. I have no idea if that theory is true or not but I was happy to go with it until a friend told me this week of her personal concerns about eating garlic. The other kids at school wouldn’t sit next to her, you see, because she smelled of garlic, and yet her mum apparently cooked with garlic all the time. Perhaps it was simply because garlic was so much more unusual back then? Everyone cooks with garlic today, don’t they? And so here we all are, happily munching on garlic and smelling of garlic together, while the exceptions among us are much too polite to mention the stench. Even if someone did say something though, I’m not sure I could ever give up my garlic habit. 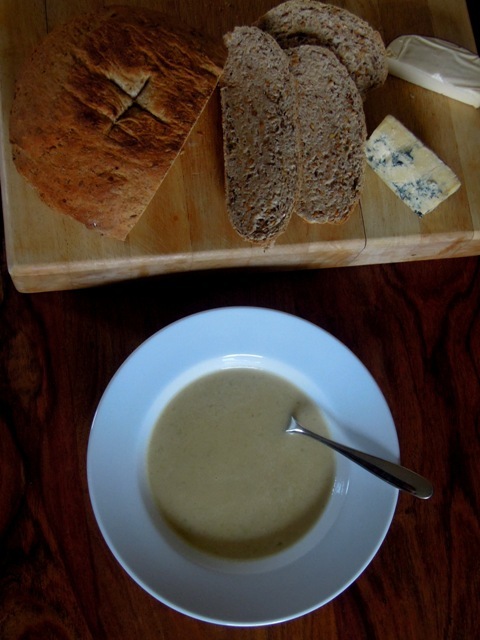 That would mean no more roasted garlic, a staple whenever we make a roast dinner, and also the star of this fantastically simple soup. Made in a matter of minutes and with just a handful of ingredients, the garlic shines through as the star of the show and, because it is roasted, the garlic is much less pungent and instead takes on a much milder and beautifully sweet and earthy flavour. Preheat the oven to gas mark 6 / 200° Celsius. Place the garlic head on a large piece of tin foil and drizzle with a little olive oil. Wrap loosely and place on a tray in the oven. Roast for 30 to 40 minutes until the garlic cloves are squishy. Allow to cool a little. In a large saucepan, heat a little more olive oil over a gentle heat and fry the onion until soft and translucent. Simply add the butter beans and stock. Squeeze the gorgeously gooey garlic from the skins into the pan and puree it all into a soup with a hand blender or in a processor. Taste and season with salt and pepper if required. That’s all there is to it. Serve with fresh bread and cheese or cold meats for a super easy lunch or light supper. And maybe take a packet of mints out with you tomorrow. But if you’re like me, I really wouldn’t worry about it. This article was first published in the Wells Journal on 13 March 2014. I often ponder at this garlic dilemma too, but I doubt very much I’d do anything about it if anyone complained!. Though I have to say the issue was of greater concern when we lived in France and there was always a good deal of kissing going on, of the hello and goodbye pleasantries I mean!. Far too often did I have to partake knowing fully well I stunk, making and tasting hummus loaded with raw garlic being the biggest culprit for embarrassment. Ouch. 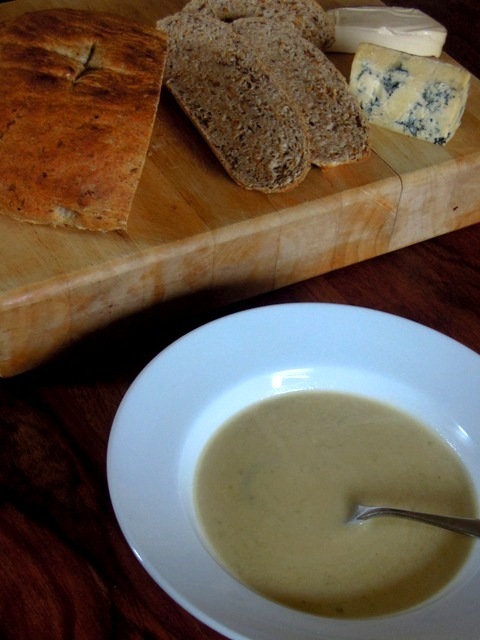 Your soup sounds soothingly delicious, I’m a big fan of roasted garlic too! Great looking soup, I’m sure roasted garlic is much less pungent on the breath than the fresh stuff. My theory is that there’s garlic in so much of the food we eat these days that we all smell of it so we don’t notice it anymore – I have no idea if this is actually true, but it comforts me to think it might be!